This article was originally posted on the Lamplight Analytics Blog. Andy’s worked at some of the biggest social media tech startups in the APAC region, so I thought it’d be a great opportunity for to learn from someone who’s seen tremendous growth and been through many ups and downs in the industry. I’m a digital nomad – I spend my time freelancing in digital and social consulting while I hop from country to country exploring (and eating my way around) the world. My professional background has spanned across sales, marketing and customer success in tech companies with my most recent focus around social relationship and listening software solutions. Is there a moment in your career or life where the power of social media and / or analytics really clicked for you? Absolutely. It really hit home for me when a recruiter (who later offered me a role) mentioned that he had found me because he saw my activity on LinkedIn and Twitter. Content that I had posted and the people that I was engaging with aligned with a role he was looking to fill. Of course, I still had to perform in my interviews but social media opened the door to an opportunity that I otherwise would never have known about let alone reach out to apply for proactively. Even now, social media doesn’t cease to amaze me. What are some quick things you feel that any company can do on social media to immediate improve their online or social media presence? The best approach is to shift your mindset and not think about ‘quick’ and ‘social media’ together. Whether you work for yourself or you’re convincing an internal stakeholder, social media and the strategy behind it is a long term because you’re spending time establishing relationships with your customers. With that in mind, think about the type of content you’re publishing and the way you are engaging with customers. Show that you’re genuinely interested in helping them and that’s the quickest way that you’ll see results. 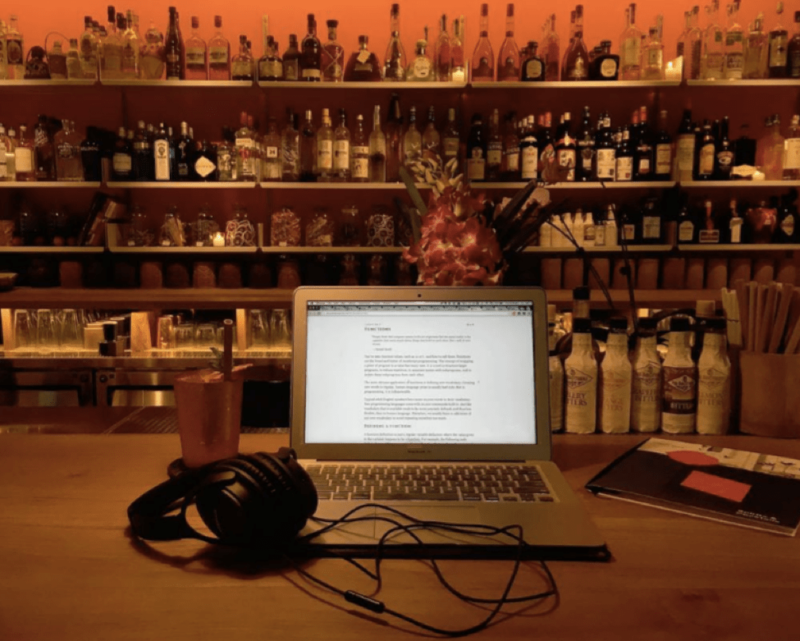 As someone online, Andy can work remotely at any time, allowing a visit to a bar to become an office. From your experience, what is a common mistake you’ve seen made by individuals or brands starting out in social? Jumping on the bandwagon without thinking. Clients often reach out to me having half started posting on Facebook, Instagram, LinkedIn and Twitter, frustrated by the lack of results compared to the bigger players or their competitors. In many cases, they haven’t quite thought through what business goals they’re hoping social media can help drive for them and don’t have the capacity to manage so many channels anyway! My best piece of advice is to start slow – think about your goals and objectives and focus on one or two priority channels first. It can take a little while to get things right and the only way you can do that is by testing and learning. How should smaller companies and larger companies use social media differently? No matter the size of your organisation, you should still be leveraging social media as a channel to create a dialogue with your customers with the goal of establishing relationships. The only difference is time and resource which means smaller companies may need to be more disciplined around prioritising which campaigns to run and be mindful of how ambitious they can be with certain ideas. At the same time, their upper hand is being able to operate in an agile environment with minimal approvals and push-back. How do you use social media to further your own brand? As such an open and far reaching medium, I’ve used social media to develop myself as a thought leader primarily in digital marketing but also in my other areas of passion like food & travel, photography and remote work. This ranges from publishing blogs and participating in Twitter Chats to reaching out and engaging with others in similar industries. It has helped me establish relationships with people all over the world and have led to both jobs and speaking slots as well as mentoring and coaching opportunities before, and more recently been the way that clients proactively reach out for my help. Where do you see the future of social media, social media analytics and marketing trends headed? Past, present and future will continue to focus on the evolution of content. While everything else in digital changes so dynamically it’s hard to keep up, content will always be highlighted as the constant which significantly impacts the success of all marketers and brands. As we move forward, marketers must utilise the right tools to make data-driven decisions around engaging content and creatively embrace mediums which build the most user immersive experiences. We’ve already shifted from copy to image to video – with the new phenomenon of Pokemon Go putting augmented reality back on the map, this could be a renewed approach to developing content.